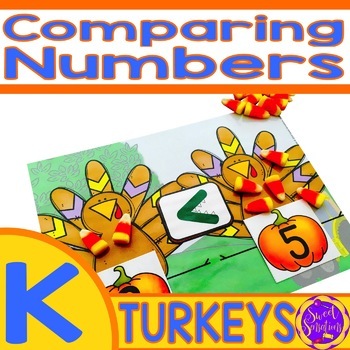 Compare numbers and find greater than, less than and equal to, with a Thanksgiving theme that can be used year after year! Use as a stand-alone product, or as a great companion math station to Comparing Numbers: Greater Than, Less Than, Equal To: Kindergarten (KCC6, KCC7). Students pick a candy corn card and take a corresponding amount of candy corn (either real or use the printables provided). 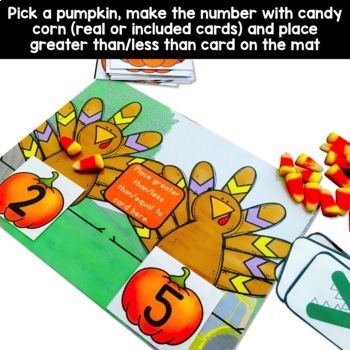 They place the candy corn on the first turkey, and repeat taking another card and placing the correct amount of candy corn on the second turkey. 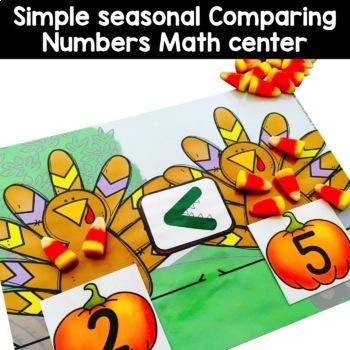 The student then needs to decide which symbol goes in between the turkeys, and records either with a dry erase marker or uses the greater than/less than/ equal to symbols provided. 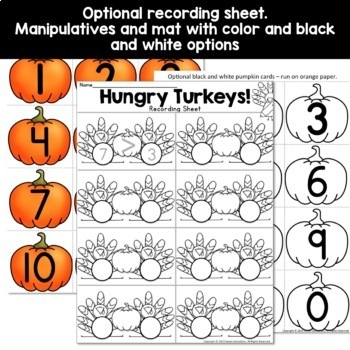 Students can then record their answer, by writing the numbers on the turkey's tummy, and then drawing the correct symbol in the pumpkins on the provided recording sheet. Includes color and black and white printer friendly version. A page of blank candy corn has been included for you to write your own numbers on, or draw dots for the students to use. This product is designed to be used in a home/school setting, a kindergarten and first grade setting, for remediation, math groups and assessment purposes. I recommend that you print on cardstock and laminate. K.CC7. Compare two numbers between 1 and 10 presented as written numerals. Click here to see more Kindergarten math resources! ALL PRODUCTS are 50% off for the first 48 hours after uploading. Don't miss out! Follow the green star for my store, Sweet Sensations and leave a rating, and like my Facebook page to stay in the loop!